It's been a busy week! I worked Tuesday and Wednesday, Thursday Bradley had his little kindergarten graduation ceremony and Friday my mom was supposed to close on her house, but didn't. So I ran back forth helping her out, plus getting the room downstairs ready for her stay in. Sorry the picture is not the greatest... still trying to figure out my new camera. Sometimes I think newer is not always better. :) Well, not much else going on here. I've got to work the weekend, and one day next week and then I get over a week off... can't wait!! Write later! Wow, Nicole the Prairie Schooler looks charming. 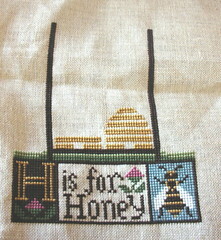 What do you mean 'teeny bit' -- looks like the bee & H squares are solid cross stitching. Cannot wait to come back & see more progress. Kindergarten graduations are so much fun : ) Congrats to Bradley! H is for Honey is nice! What great colors! We would love to have you join us with the WOTM SAL! That would be cool!